After a busy summer, I sometimes lose track of the fabulous Fall Aspen events that we have available as well. I know – it’s still technically summer -- but here in the mountains of Colorado, once September hits it begins to feel like Fall, especially with the coolness of early mornings and late evenings. Still, the daytime temperatures often remain quite warm, so we can continue to enjoy the signature events that make Aspen so special. The Summer to Fall transition begins with the annual Labor Day Aspen events such as the Motherlode Volleyball Classic and the Jazz Aspen Snowmass Labor Day Festival. We missed these this year because we were hiking Huron Peak, but we made up for it last weekend. 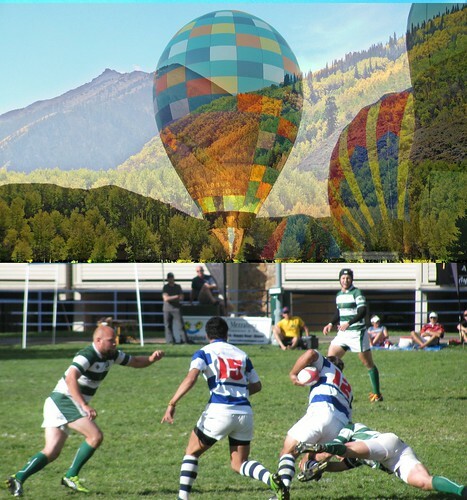 Amid the splendor of nature’s annual display of spectacular Fall colors, we enjoyed the annual Aspen Ruggerfest rugby tournament and the Snowmass Balloon Festival! Although Ruggerfest and the Snowmass Balloon Festival don’t always quite coincide with the peak of the changing of the foliage, this year they did and we hit them all – Snowmass Balloon Festival "Night Glow" on Saturday evening, a lovely drive up the Castle Creek valley to view the Fall colors mid-day Sunday, and the Aspen Ruggerfest finals on Sunday afternoon. I’ve seen the hot air balloons in their glory many times from the highway, but despite having lived in Aspen for most of my life, this was my first up close Snowmass Balloon Festival experience. With a rock band playing in the background, watching the balloons inflate and light up reminded me of a rock concert with a fireworks display -- the crowd was certainly electrified. 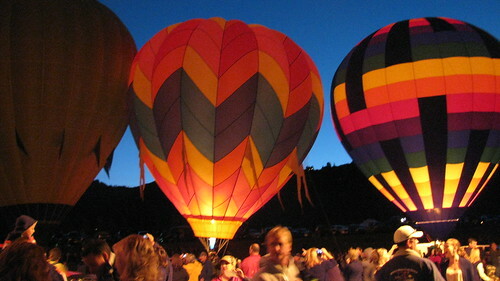 The sight of the colorful, creative inflated balloons with the Fall colors gradually dimming in the background, the flashes of heat and light from the burners, and the excitement of the crowd made us a little giddy. We were not sure how spectacular this annual show of nature would be this year due to an early summer drought and basically unusual summer weather in general, but we were pleasantly surprised as we made our way up the Castle Creek valley towards Ashcroft. The scene at the top seemed right off of a painter’s canvas and the thick stands of Aspen trees lining the road on the way there were breathtakingly florescent in the mid day sunshine. 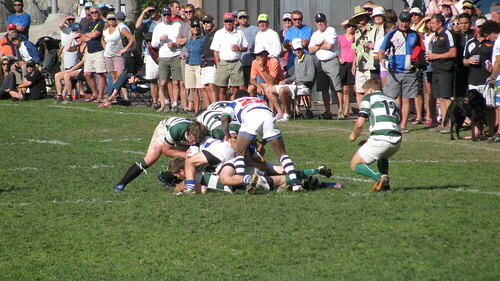 I was a little disappointed at first that the Gentlemen of Aspen’s rugby team did not make it to the finals of Ruggerfest this year and that the weather was almost too nice for my idea of a “real” rugby tournament – you know, muddy, nasty -- tough, like the players themselves, but I did enjoy the excellent rugby action between Aspen’s arch rival, the Denver Barbarians and their cross-town foes, the Glendale Raptors . Actually, even though it wasn’t real rugby weather in my mind, it was fabulous rugby VIEWING weather and allowed for a more comfortable photo taking experience. Wow, another great weekend and we didn’t even have to hike 11 miles and scale 3,500 vertical feet to experience it! We can’t wait to avail ourselves of upcoming Fall Aspen events, like the Aspen Filmfest.